Fullerton Paint & Flooring carries an extensive selection of architectural paints, finishes, and coatings from leading brands, such as Benjamin Moore, PPG Pittsburgh Paint, and AFM Safecoat. We're also the best paint store in Orange County when it comes to knowledgeable staff, paint color matching, and customer service. 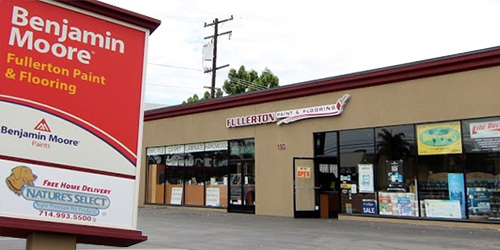 Our independently owned paint store has more than 25 years of experience and has served tens of thousands of satisfied clients throughout Orange County. As servicing professional painting contractors, we have the expertise to advise you on the correct paint application for any interior or exterior surface, and we have an excellent reputation for providing high-quality paint at a great price. Different surfaces require specialized paints for maximum adhesion and coverage. For example, exterior wood expands and contracts with temperature fluctuations and requires flexible paint that is also mildew and UV resistant. Other surfaces, like stucco, composites, siding, and metal, each require their own proper paint product. You can rely on Fullerton Paint & Flooring to recommend the best paint solution for any surface. Our highly experienced team will answer your questions and explain the differences among waterborne paints, acrylic, resin systems, alkyd, stains, and specialty finishes. They will even walk you through the entire painting process – from prepping your surface to actual paint application. Partnering with our staff will help you eliminate "do-overs," save you valuable time, and ensure you get it done right. Stop by our Anaheim showroom and get to know our team. At our store, we have thousands of paint color options; a variety of finishes, such as matte, gloss, satin, and eggshell; and a wide array of protective coatings for residential, commercial, and industrial applications. Our paint and coatings are available in convenient quart, gallon and five-gallon containers. We can ship or deliver upon request. We also have paint brushes, tarps, textures, patching materials, and anything else you might need for your paint project. If you are interested in our paint color matching services, just bring a sample of the color. We can match practically anything. We can provide half-pint samples for color testing of all standar Benjamin Moore colors.